No one was happier than I was to receive the news, directly from the chocolate-maker himself, that Askinosie was jarring up a chocolate and hazelnut spread. To make the spread, cocoa powder is made from pulverized cocoa beans sourced directly from the farmers in the Philippines, and hazelnut butter is made from nuts harvested from an orchard in the Pacific Northwest. Then they’re both ground together with a modest amount of sugar and a few cocoa beans tossed in the mix. I don’t have any problems with Nutella, but I know some people are concerned about exactly what’s in that too easily-reachable oval jar. I don’t regularly buy it, but have been known to dip my knife into a jar every now and then myself, and wonder what quantities people are eating it in that makes it problematic? I suppose if I was plowing through a jar a week, I’d be more concerned. But for an “occasional user” like myself, I’ve got bigger fish to fry. Still, I was happy to hear that there was a chocolate-hazelnut spread made with ingredients sourced direct from their origins, created by a pioneering American bean-to-bar chocolate maker. I’m always interested in what the bean-to-bar jar chocolate makers in America are up to, because it’s been such a wonderful phenomenon that’s taken place over the past decade. And was excited when Shawn Askinosie offered to ship me a jar for tasting when I was recently stateside. I wasn’t sure what to expect when I took it out of its protective (recyclable) padding and twisted off the top of the jar. Dipping in my knife, I found the spread to be not dull, thick, and gunky, but oozy and glossy—no doubt, from all the oil-rich roasted hazelnuts in the jar. 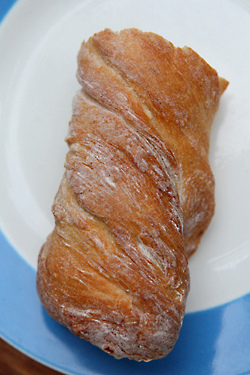 It was just thick enough to hold its shape on the knife, and I wasn’t sure if I should lick it off the blade or smear it over a few slices of the beautifully twisty torsade baguette I picked up at Blé Sucré. A quick bite a few moments later…and, yes, an illicit lick when no one else was looking (hey, it’s my jar, and I can do with it whatever I want…), I was immediately hooked. It reminded me of the great gianduja pastes I’ve gotten in Torino, Italy, where the luxurious combination of chocolate and Piedmontese hazelnuts was invented. And every time I go there, I always bring back enough jars that I think will last me until my next trip. Of course, they never do. The chocolate flavor of this spread, as well as the texture, is ramped up because of a handful of roasted cocoa nibs blended in, which gives it a very soft and subtle crunch. The nut-buttery flavor of the hazelnuts really comes through as well, since the percentage of nuts…plus the quality, is greater than its universally-available cousin. I could definitely see eating a jar of this a week, or postponing my next trip to Italy because I still have almost half a jar left. But I’m not sure how long it’s going to last—because the week isn’t over yet. What’s the Difference Between a Chocolatier and Chocolate-Maker? I wish we Europeans had more access to the great bean-to-bar chocolates being crafted in the US. But I guess that’s just one more good reason for taking a trip over. That plus all the good places to visit in NYC that you’ve blogged about. But I guess we have much to enjoy here too. Just got back from Puglia and I so much enjoyed all on offer! And the sun too! We don’t really get any sun here, north of les Alpes. How does this spread compare to the likes of Slitti? That’s the best I’ve had. Or have you by any chance tried the new Amedei spreads? I finally managed to break my Nutella addiction by reading the ingredients list and convincing myself that Nutella is really margarine with chocolate and hazelnut. Sometimes ‘odd’ ingredients turn up in the most common places–I recently noticed that Rice Krispies and almost all commercial versions of graham crackers have HFC syrup. I hate to sound like one of ‘those type’ of neurotic people, I have noticed that HFC does spike my blood sugar. I think the primary objection people have with Nutella is palm oil. I’ve only had ‘organic’ versions of Nutella–your discovery actually looks much better than the ‘real stuff’ or anything else I’ve had–much richer in appearance! Nutella’s ingredients vary country to country. The version available in the US has artificial flavor in it. I don’t eat it that often; I do love the hazelnut ice cream from chocolate and zucchini, but will look for all natural brands (either another brand or imported nutella) to make it. 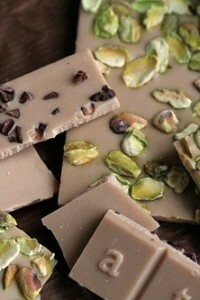 Askinosie has been one of my favorite chocolates since my friend Sherry introduced me to them. And the last time she visited, she brought me the spread you described… so good! Eleanore K: They do ship internationally, I discovered. Visit their website (linked in the post) for more information. Noah: It does? That’s odd. I wonder if it’s vanillin (sythentic vanilla) or something else. can’t imagine what kind of flavoring chocolate-hazelnut spread needs in addition to those two ingredients. adrian: I’m not quite sure why because there are some very good small-batch chocolate makers in Europe. But interestingly, it’s hard to find their chocolates. Perhaps because the Americans are better at marketing their wares? Oh I want to try that! Hm, I don’t quite get what you mean, David? Which European chocolate makers do you mean? I’m curious. I’ve been able to find most here in Munich (Domori, Amedei, etc. But those are not small-batch any more). My trouble is getting the stuff shipped from the states or from the UK, although a few things are starting to appear here now. I can get Amano and now we also have access to Willie’s chocolate from the UK. As for marketing, Americans are definitely ahead of Europe. I found it impossible to find any Italian chocolate products in France or Paris. There is a very strong bias there. You’ve heard of the troubles Amedei had with Valrhona? Hi Adrian: I mean Slitti, Amadei, and Domori, which are unavailable in Paris (except in rare instances.) And other brands like Claudio Corallo, El Rey, Chocovic, Green and Black’s I’ve not seen anywhere. And even French companies like Weiss, Bonnat, Pralus, and Bernard Dufoux aren’t easily found–although Pralus has made a push to become more widely known by opening stores, and Weiss is opening one in Paris as well on the rue de Seine. I will keep my eyes open for this new spread. We are Nutella fans but don’t overindulge it either. I love chocolate! I love hazelnuts! But, Nutella not so much. Only last week!—after hearing raves how wonderfully decadent Nutella is from a variety of friends for years, I finally decided to see what the noise was about. I tried two small spoonfuls, the second one because I couldn’t believe how ordinary it tasted. Yep! Second spoon confirmed it. It is ordinary. Screwed the lid back on. No more for me. It was flat, bland, and just plain blah. What you show in the photos from Askinosie looks far more appealing. It’s a richer texture, the dark color. I’ll consider giving theirs a try! Will check out the Web site next. I’d be greatly tempted to open shop in Paris. Pralus has done a nice job and it’s great that they offer tastes of their Praluline! If you ever need any of the chocolates you mentioned I’d be more than happy to send you a Care package. Just drop a line. Excuse me for using your comments here for this discussion. Will stop here. 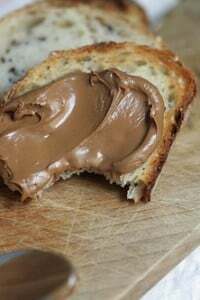 We used to have Nutella Mondays to motivate the kids to get up and out of bed, but once I became a label reader, I stopped and have found several natural hazelnut chocolate spreads. This one sounds divine and I will seek it out immediately. Nutella can pack a calorie punch if you are not careful. Although the ingredient list should slow you down. Now I am on a Askinosie hunt. There are a couple of shops that may carry it. Otherwise I going to visit their website. In a town down the street from our home (which is west of Philadelphia) we actually have a Chocolatier at Eclat (http://www.eclatchocolate.com/) but no bakery. I have always thought that was interesting. 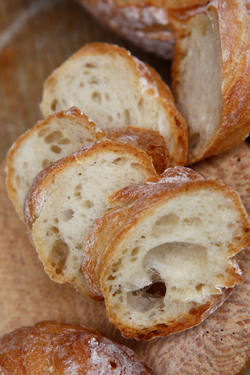 Fresh baked breads are brought in once a week to the farmers market, thank goodness. 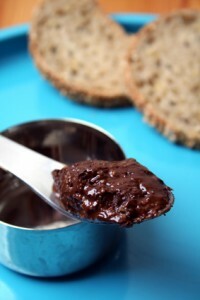 Sounds great, but I recently discovered (after being dismayed at the Nutella ingredients, and reluctant to buy a whole jar for myself) how easy it is to make chocolate-hazelnut paste at home. Roast up some hazelnuts, add melted chocolate and olive oil (or hazelnut oil), a little salt, vanilla, and confectioners sugar, and it was perfect. And I could make just a little ramekin full, not enough to be dangerous. Laura, Greg & heartofglass: Interestingly, I was just at the grocery store and picked up a jar of Nutella and huile végétale was listed as a primary ingredient. Most sources say that’s palm oil they’re using in there, in France, but I know that ingredients and composition vary by country. CM: I also think you could try it with hazelnut butter (paste) and just add chocolate or cocoa powder. I linked to a more rustic recipe that I made a while back, which used cocoa nibs and was barely sweet. 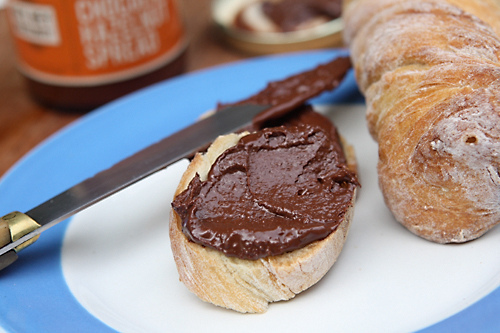 Did you ever try the chocolate spread from Le Pain Quotidien? I’ve tempted… but then I don’t think they have cocoa nibs. Have you tried MaraNatha Dark Chocolate Almond Spread? Different but the same and personally waaaaaay more addicting than Nutella. Slitti is better, if you can get it. I’m googling where to buy it ASAP! Greg, I, too, broke my Nutella fixation by studying the ingredients. That doesn’t mean I don’t give it a long, hard look each time I pass it in the grocery store, and relive past spoonfuls going straight from the jar to my mouth. Try this Dave…….Dark chocolate and white chocolate peanut butter from peanut butter & Company.. Being one of the many wonderful things I experienced on my first trip to Europe many years ago, Nutella will always have a special place in my heart. Is Askinosie’s really that good? I love chocolate because it goes to just the right spot in your brain – the super, super happy spot. How does it know? But Nutella is just a little TOO good at finding that spot. It’s so addictive that I suspect the involvement of evil food science. I can’t buy it because I will eat it by spoon until it is gone, and wake up 3 days later in an alley with amnesia. Not really, but still, you just don’t stand a chance of resisting Nutella. Perhaps with Askinosie I might be able to enjoy it without turning into a spoon-wielding zombie. Plus, the cocoa nibs practically make it a health food. Do too. Thanks for the chocolate insights. They are always welcome. I’m a Pralus-and-Cluizel-loving plantation bar type, but I forgot about Theo. Going looking tomorrow. I wonder what is wrong with me that I don’t have the Nutella thing; I find it sort of thick and not all that tasty…but now of course wishing I could find some Askinosie to make a real determination of whether I like a chocolate/hazelnut paste. I like the idea of it, does that count? Here in Canada, the first ingredient in Nutella is sugar, and the second is hydrogenated palm oil. I’ve met Shawn Askinosie earlier this year at the Fancy Food Show in New York, and based on our conversation the guy seems very passionate about producing pure high quality products. I was lucky enough to have a generous dollop of this paste at the conference, and I can tell you that this is not something you compare to Nutella. 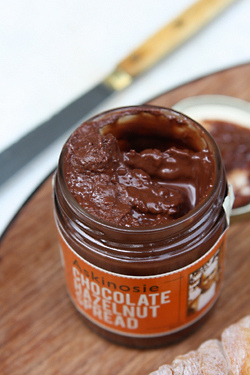 Askinosie’s hazelnut chocolate paste is heavenly! You can actually taste the natural raw flavors of hazelnut butter and chocolate without the distraction/enhancement of excess sugar or taming other fats and additives. David, I am so glad to see you feature this on your blog! In Turkey where the majority of hazelnut production exists by the Black Sea they produce many different hazelnut spreads including a dark chocolate spread. Yummy. 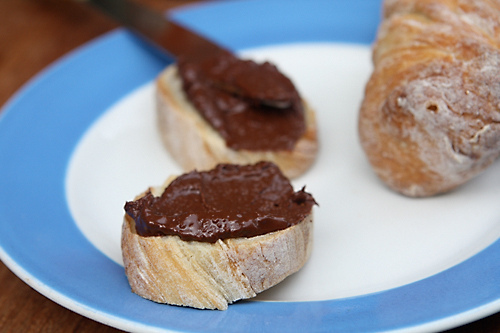 Most of those Nutella type spreads use hazelnuts from Turkey. Hm! Jean Hervé has a very nice organic chocolate-hazelnut spread, too. Very nutty, slightly salty… so much better than Nutella! David, I’m kicking myself because I saw this at a shop in downtown Chicago and we passed on it. We are Nutella fans, but since they started production of the US brand in Canada, it has become less chocolatey and more cloyingly sweet. We thought our only option was to beg Italian cousins who visit to bring a jar from overseas. Thanks for the suggestion on this one. Love the idea of added cocoa nibs…. It was fun seeing your video on CNN about what you bring home from the U.S. Peaches are beautiful and plentiful here in Oregon. However, my polenta topping is not turning out as I think it should. The course corn meal does not seem to be cooking and so there are hard grains in the topping. Please advise…quick! It looks so good and I WANT to like it, but I hate hazelnuts. I wish they could figure out something else to make it with. An almond version? I grew up on some really good stuff my grandmother Nina called Cremona. the closest I’ve found to it. You’ve got me really curious about this Askinosie stuff. Looks divine. Oh, my. This looks amazing. Unfortunately, I have been officially lactose-intolerant since Tuesday, so all I have now is reading these brilliant and refreshing posts about chocolate-hazelnut spreads. My favourite has been the Galler hazelnut spread but I would taste this one any time if I could. Maybe, there is no milk in it. One can hope:). Okay, I checked. It seems milk-free. Great news!!! It’s odd, I’ve seen the ingredients on the Australian Nutella jar evolve over the past few years – they’ve gone from using vanillin and peanut oil, to vegetable oil and ambiguous “artificial flavours” (probably vanillin), to having trans fats, to being trans fat free, with percentages of sugar and hazelnuts swinging back and forth. As much as I love it, it is actually just gross stuff mixed together and poured into a jar. However, homemade versions just lack the oomph and addictive qualities of its commercially available cousin. Guess I’ll just need to keep boycotting the stuff. Hello! I live in Berlin and I’m a food writer and editor for a magazine. I have been looking for a decent hazelnut and chocolate spread…and well, the famous one is very popular here, of course! But this one looks unglaüblich! Do you know where I can ask for it? A website or an email, please? Thanks for the link to your own recipe. In its barely-sweet, textured splendour, it looks completely divine. Reminds me of after school snacks yum! I’ve never been a fan of Nutella but was surprised by my reaction when I tried the pate à tartiner at Le Pain Quotidien in Brussels several years ago. I liked it!!!! I bought a jar of the noisette and the chocolat blanc immediately. Will look for a jar of Askinosie when I’m in the US next. Thanks for the tip, David. I didn’t know it was now possible to order chocolate from the states for overseas shipping. I just ordered two bars from Rogue. Have heard so much about them. Now’s my chance to try ;-) Yes! Let me cast another vote for Nocciolata. This Italian alternative to Nutella is organic and has no artificial ingredients. Tastes better too. You make it sound so ominous. And there is an ingredients list on the jar, so anybody who wants or needs to know can read it. I do hope that when Deb took you to Bespoke Chocolates on your last NYC visit that you got to try some of their hazelnut spread. It contains some almonds as well as hazelnuts, and is silly expensive, but it’s totally converted me and I can’t eat Nutella anymore. Or any of the other, better ingredient spreads for that matter. I have to admit that I used to keep two jars of hazelnut-chocolate in the house: one ‘cheap’ jar for the kids and a jar of Bespoke’s for just me. David, have you ever tried making hazelnut chocolate spread? I ask because I have a food processor, a bag of hazelnuts in the freezer, and some very good cocoa powder in the pantry. oh, i see the recipe now. But it doesn’t have hazelnuts in it, just the oil. I guess I’ll experiment. I loved reading this post about your first sushi experience…particularly the part about showing off with “les baguettes.” I remember mastering chopsticks for the first time and feeling so proud! Whoops, my above comment was in regard to your https://www.davidlebovitz.com/2010/09/mastsuri-sustainable-seafood-japanese-sushi-bar/ post. Sorry I placed in the wrong place….but now I have read your post about Askinosie too. Will have to try this. It looks delicious! So Davide/Askinosie/Nutella fans, What sorts of clever things do y’all do with the stuff other than spread it on crusty bread? This paste looks like a Nutella innovation! chocolate and nuts are just unbeatable together, aren’t they? But can this paste beat the original Nutella? I’d love to get some Askinosie chocolates shipped out to me here in hte Antipodes, but last time I checked it was going to cost something like $200 in shipping so I will just have to sit here and glare at my screen enviously. My kids love it spread on slices of apple (so do I *giggles*). My kids’ friends love it on crepes. A friend’s secret ingredient in a cup of hot chocolate is a teaspoon of Nutella. In my opinion, it also tastes pretty good on a slice of warm toasted American white or whole wheat toast, especially with a thin layer of freshly ground peanut butter. That said, filbert and chocolate spreads of the kind David is showing us in the above post certainly must be heaven for anybody who loves this kind of spread. And it is also my experience that Nutella produced in Italy tastes different – better! – than the one I know from the States and even the one available here in Austria (I would have looked up the ingredients lists but my youngest is hiding the jar – knows her mom too well!). It is always a joy to read your comments. I love your Dulce de Leche brownies! I am a native Pacific Northwesterner, and I am glad to hear that our famed hazelnuts are traveling. Portland acutally has a great food scene, you should schedule a book signing here! Do you have any plans to incorporate this into a dessert? Crepes might be yummy with this, maybe some strawberries! it really perked me up to see that they source their cocoa beans from Philippine farmers! i certainly hope i can get a jar! i love the cacao cooking tablets we get here! My kids lived on Nutella and bread when we first moved here (luxembourg.) Fortunately it’s run it’s course. I did take a cooking class in Lux where a hazelnut paste (not Nutella, but an organic one. The name escapes me) was added when making chocolate mousse. Topped with crumbled speculoos, it was delish. My local chocolate shop in Washington DC just got the Askinosie spread in this week, I have yet to try it, but am very glad of this write-up in terms of welcome publicity for Askinosie. Nutella, in N America at least, has relatively little to do with chocolate. Anyone know if any country’s version contains any real cocoa butter? Amedei’s Crema Toscana Alla Nocciola is very creamy, I prefer it to both the Domori and Vestri spreads. However, the Amedei contains milk powder and vanilla, as does the Vestri. Can any of these really be considered crucial to a hazelnut/chocolate cream? Not in my book. The Domori has lecithin but no milk, the Vestri has it all- including vegetable ‘fat.’ However, my favorite of all is the Pralus Creme de Noisette- not as creamy as the others, but with a delightful slightly rough texture due to small bits of hazelnut that are too small to be crunchy but enough to alter the experience. Another top American small batch producer, in addition to those mentioned already (Amano, Rogue, Askinosie) is Patric Chocolate. Primarily focusing on Madagascar beans until now (3 percentage varieties plus a nib bar,) he released a Venezuelan origin Rio Caribe a year ago or so. Also, Toronto Canada’s SOMA is another fantastic entrant to the fine chocolate scene. As to why the US has a more visible micro batch scene, perhaps it’s because there isn’t as much of a tradition of fine chocolate (Hershey’s has always been everyone’s concept of ‘chocolate’ until recently) so there’s perhaps less of a firmly established ceiling. Have you come across those people who swear up and down that Marcolini is the best thing ever (and by extension Belgian chocolate is supreme…), but aren’t open-minded enough to realize that the brand isn’t what it used to be? Well I suppose there’s nothing domestically for the American brands to have to fight to dislodge from a dominant position, so there definitely is a gap to be filled. Plus there has never been the devotion to tradition here that can possibly still be argued to exist in some European cultures. Not an overt criticism of our various societies, just a thought. Hi Alejandro: That’s certainly true that Americans are discovering (or rediscovering) many of our lost or forgotten food traditions. I did profile < https://www.davidlebovitz.com/2008/05/patric-chocolat/‘>Patric chocolate on the site a while back, as they are worthy of mention, too. There is a prevailing wisdom that Belgian companies, such as Marcolini, are superior chocolate makers. But basically, I encourage folks to taste chocolate and decide what they like for themselves, not necessarily listen to others that tell people what is “the best”. I don’t know what’s in the Slitti chocolate-hazelnut paste, but it’s pretty amazing. It’s called Nocciolata and I don’t know who carries it, but it’s worth tracking down! I ordered the spread and I am so very much hooked!! That little 6 oz. jar is $13, with tax and shipping, I’d imagine it’d cost close to $20. I can’t afford frivilous spending like that, I’d stick with Nutella, thank you. 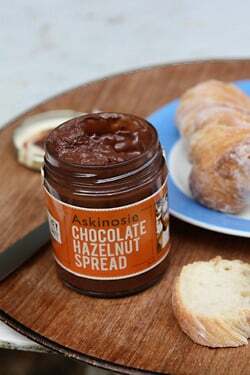 As someone who enjoys both products, Nutella and this Askinosie spread, I’d have to say these are two very different products. This one has cocoa beans that are sourced and harvested on a small scale then roasted and blended in a very small facility. Nutella is made on a global scale and has a variety of ingredients in it, a few that some people choose to avoid. So this is a delicious alternative for those people. Because of the production methods (and the shipping), as much as they’d like to price it competitively with Nutella, and brands sold in supermarkets, I don’t think they can. ingredients: sugar, palm oil, hazelnuts, cocoa, skim milk, reduced minerals whey (milk), lecithin as emulsifier (soy), vanillin: an artificial flavor. The two primary things I pick up on are palm oil (in place of cocoa butter which would be present in something made with ‘full’ chocolate; my best guess here is that cocoa means powder form, which generally has only trace amounts of cocoa butter) for creaminess, as well as the presence of two types of milk/dairy. Which basically, and simply, points to Nutella being a very industrial product that I daresay millions worldwide thoroughly enjoy. An interesting point is that the site also says Nutella “is a tasty unique spread made from the combination of roasted hazelnuts, skim milk and a hint of cocoa.” While cocoa is fourth in the ingredient list, I suspect that for the majority- actually I expect for all- of the smaller-scale spreads listed in various comments above that cacao, hazelnut, and sugar would be the top three in various permutations depending on brand. I tried this spread recently – paid $17 for it at an Italian specialty store. What a disappointment – I threw the jar out after trying a teaspoon of it. I’ve steered away from the Nutella I loved as a teenager in France because the US version seems to lack the true hazelnut flavor and takes more like chocolate butter spread, made with Hershey’s-quality chocolate. However, I have tried a range of choco-hazelnut spreads from Whole Foods including Nocciolata, Rapunzel Choconut, and others, as well as Neuhaus’s chocolate hazelnut spread from my last visit to Brussels. Nocciolata is superior.